The Greeneville/Greene County Campus serves as an extension of the main campus in Morristown offering both credit and non-credit courses to the citizens of Greeneville, Greene County and portions of upper East Tennessee. The Campus allows students who are geographically remote from the main campus to take classes closer to their homes. Course offerings include most courses in the General Education core and additional technical education courses for various degree and certificate programs. The facility was made available through the generous efforts of the governments of Greene County and the City of Greeneville, along with the Walters State Foundation. The facility includes (15) fifteen smart classrooms with the latest technology, general education classrooms, distance education learning opportunities, five computer labs, chemistry, biology, human anatomy and micro laboratories, student lounge areas, media center, and administrative offices for student services. 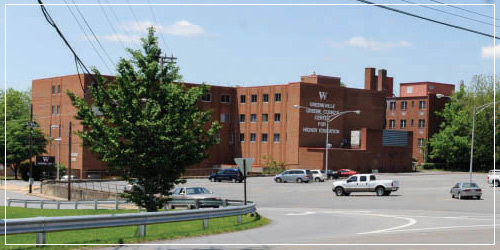 In addition, the Campus is home to the East Tennessee Law Enforcement Academy, Respiratory Care and Nursing programs. These programs serve the entire ten county service area. Approximately 1000 credit students are enrolled at the Campus each semester. Forty- one faculty/staff members are located at the Campus with additional faculty traveling from Morristown to the Campus. Additionally, over 30 adjunct faculty teach at the Campus each semester. The Division of Workforce Training is also located at this Campus. Important information about our downtown Campus is listed below for your convenience. A "courtesy telephone" is located on the first floor next to the elevators. This phone is free of charge for local calls but does require a calling card for long distance calls. Emergency phones are located in each classroom and on each floor hallway. Vending machines are located on the first, second, and fourth floors. Student lounges are located on first, second and fourth floor. No food or drinks are allowed in the classrooms as a college wide policy. Vending is provided by the Blind Services and therefore, refunds for machine malfunctions should be processed by them. A student copier is located on the first floor in the student lounge. Copies are ten cents ($0.10) each. An open computer lab (Room 404) houses computers for research purposes. This lab is open for student use during regularly scheduled operational hours of the college. In addition to the open computer lab students have access to the computer labs housed in Rooms 407 and 408 when classes are not in session. Walters State's online library is available 24 hours a day and in addition students may access the academic resources at the Thomas J. Garland library located on the campus of Tusculum College.